The Stonewall riots were a series of spontaneous, violent demonstrations by members of the gay community against a police raid that took place in the early morning hours of June 28, 1969, at the Stonewall Inn, in the Greenwich Village neighborhood of New York City. Very few establishments welcomed openly gay people in the 1950s and 1960s. Those that did were often bars, although bar owners and managers were rarely gay. The Stonewall Inn, at the time, was owned by the Mafia. It catered to an assortment of patrons, but it was known to be popular with the poorest and most marginalized people in the gay community: drag queens, representatives of a newly self-aware transgender community, effeminate young men, hustlers, and homeless youth. 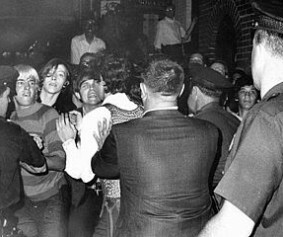 Police raids on gay bars were routine in the 1960s, but officers quickly lost control of the situation at the Stonewall Inn, and attracted a crowd that was incited to riot. Tensions between New York City police and gay residents of Greenwich Village erupted into more protests the next evening, and again several nights later. Within weeks, Village residents quickly organized into activist groups to concentrate efforts on establishing places for gays and lesbians to be open about their sexual orientation without fear of being arrested. After the Stonewall riots, gays and lesbians in New York City faced gender, class, and generational obstacles to becoming a cohesive community. Within six months, two gay activist organizations were formed in New York, concentrating on confrontational tactics, and three newspapers were established to promote rights for gays and lesbians. Within a few years, gay rights organizations were founded across the U.S. and the world. On June 28, 1970, the first Gay Pride marches took place in Los Angeles, Chicago, and New York commemorating the anniversary of the riots. Similar marches were organized in other cities. Today, Gay Pride events are held annually throughout the world toward the end of June to mark the Stonewall riots. Read more on wikipedia.org here.